SYRIA: WE HAVE A REVOLUTION TO DEFEND… VIVA ROJAVA! | Subject. Object. 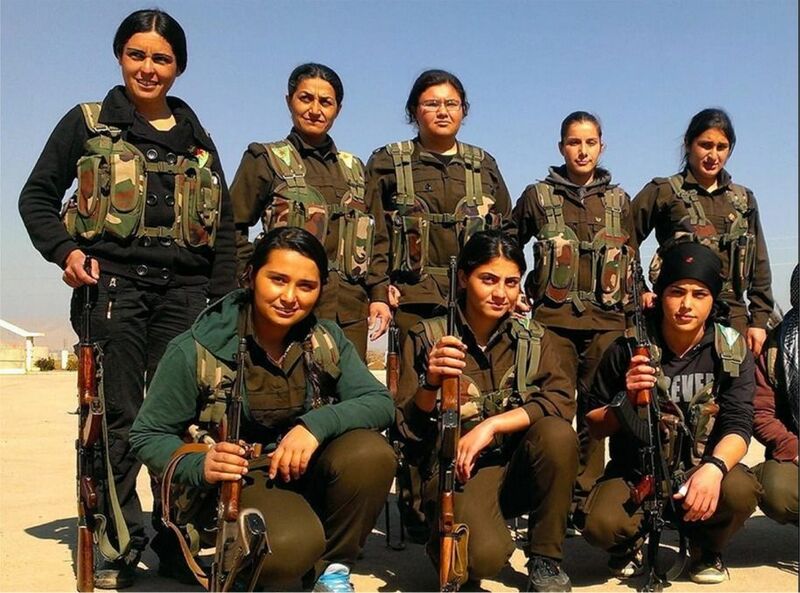 SYRIA: WE HAVE A REVOLUTION TO DEFEND… VIVA ROJAVA! I find myself at odds with many liberal and Left types in the UK, who are expressing outrage at the “extra-judicial” killing of two apparent British ISIS fighters in Raqaa, the hub of Daesh activities, by an RAF drone. It may sound blunt and inhumane, but I believe the only good fascist is a dead fascist. I don’t think it’s worth indulging in the various theories about who created ISIS and why it wasn’t crushed in its infancy. What I will say is I am convinced they fit the description of fascists. These fascists have carved out their brutal quasi-state, and we need to find a way of demolishing it and them. However, the intervention of the British military does give me cause for concern, even if the right target was hit – though I expect some will say the Army rarely gets credit for all the humanitarian work it does. But Cameron’s strike has also helped prompt a backlash against the “refugees welcome” outpouring with the claim that ISIS fighters might be among those we shelter (well, as this report shows, ISIS fighters are more likely to be Europeans rather than Syrians). The drone attack also feeds into this nonsense peddled by the British and European far-right that if we don’t “lock our doors”, ISIS will establish their faux caliphate in Britain – an even more dodgy claim than the dodgy dossier and Blair’s 45-minute WMD Saddam lie. But as the Sun etc are ratcheting us up to a war footing with Syria, and the Left is preparing its Stop the War campaign, no one is talking about the revolution that has transformed northern enclaves of Syria – a revolution which places direct democracy, women and ecology at its forefront. A revolution threatened by both ISIS and western capitalist powers, plus Turkey. A revolution that needs us all to promote it and defend it. And more rarely, a side worth taking in that Middle Eastern quagmire of competing elites. I think it’s VITAL that EVERYONE knows about this positive society that’s being created against all odds because it’ll be far easier to crush if people aren’t aware of it. So many people I speak to, and that includes pro-Palestinian activists, haven’t looked into the Rojava revolution – but they really should. Marxists shun it because the revolutionaries have turned away from Marxism in favour of the ideas of American anarchist Murray Bookchin known as “libertarian municipalism”. Many Kurdish nationalists shun it because while the revolution relies on autonomy, it doesn’t want a national state. And some (but most certainly not all) anarchists shun it because it doesn’t fit precisely enough with their school of anarchism. 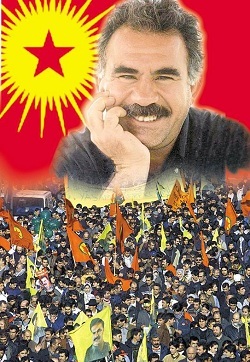 There are reasonable criticisms that can be made from an anarchist point of view: for instance, there is a leadership cult attached to Abdullah Öcalan, their moustachioed figurehead (known as Apo, or uncle) who is serving life in a Turkish prison. But then in the comparable Spanish Civil War of 1936 to 1939, figureheads emerged such as Buenaventura Durruti. 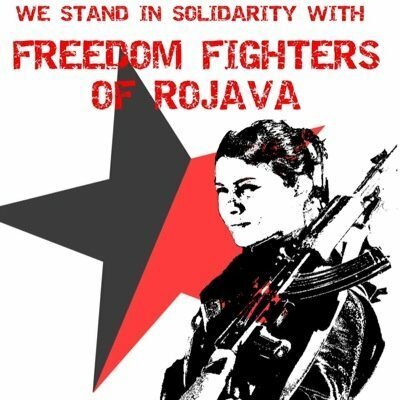 You’d think feminists would be jumping up and down to promote the Rojava revolution worldwide, but strangely they’re not, and greens too… as the revolution ticks both those boxes. Of course objectivity is very hard – probably impossible – to find in a war zone. The first casualty in war is truth. The YPG and YPJ (the Kurdish-led people’s militias of Rojava) use the same rhetoric of “martyrs” and cheer the death of their enemies (or “rats”), as Daesh no doubt do. Their statements reek of the same propaganda language used by any paramilitary organisation. The PKK, the Turkish organisation the YPG and YPJ are aligned to, is still on the “terrorists” list, so officially caught anyone travelling to or from Rojava could face the same recriminations as European IS Jihadis. But among those who’ve gone public about joining the YPG/YPJ to fight ISIS are US Christian evangelist mercenaries who served in Iraq, and even a Tory councillor. During the past year and more, the US Air Force has worked with the Kurds in bombing IS positions from the air, before the YPG/YPJ steam in from the ground and drive IS back, hopefully taking back their towns and villages in the process. Up until a few years ago, you could quite readily file the Kurdish insurgency movement which straddles Turkey and Syria with the Colombian FARC, the Irish Republican Army (IRA) or the Basque separatists ETA. They were left-wing nationalists at war with oppressive nation states in a bid to carve out their own republican states. 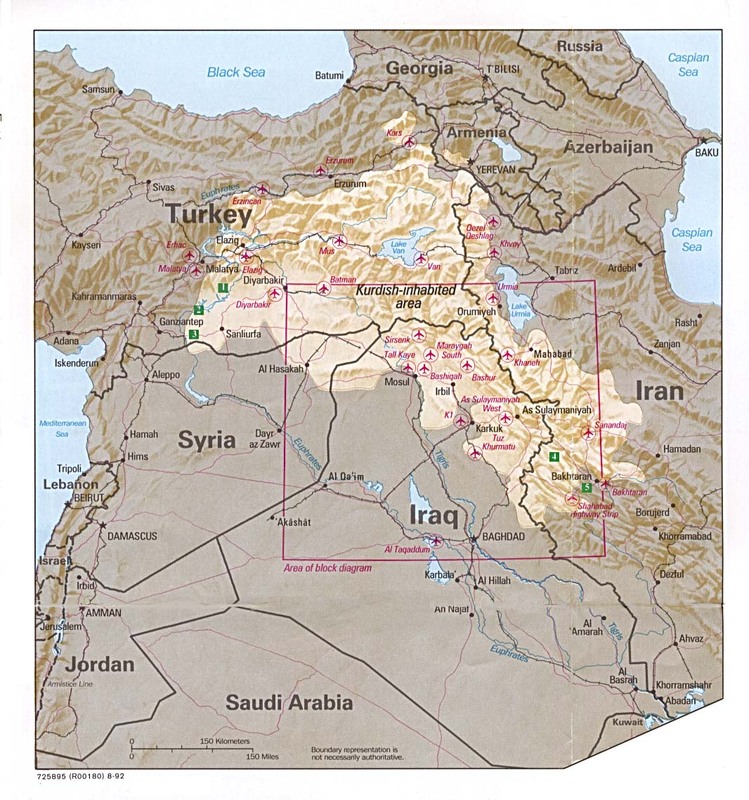 If a complete Kurdistan was ever realised, it would include great chunks of Iraq, Iran, Syria and Turkey, so you might say the Kurdistan Workers’ Party (PKK) had a few mountains to climb to achieve its aims, including gaining supremacy over a range of competing Kurdish parties. When the Syrian civil war blew up in 2011, the Kurds took no part in the fighting, however, but instead quietly set about building their own society in three isolated cantons of northern Syria which border Turkey – the Syrian dictator Bashar al-Assad was too preoccupied with the multiple paramilitary forces opposing his state troops to stop it from happening. 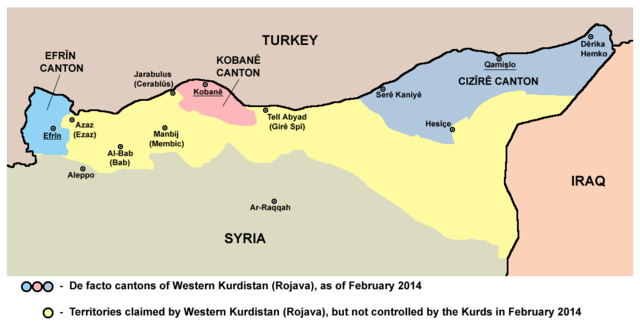 Instead, the Kurds found itself a rose between two thorns – the Turkish state and ISIS/IS/Daesh. The Turkish government seemed to prefer to let a bunch of fascists operating under the cloak of fundamentalist religion gain control of northern Syria (and potentially also Turkey) than a gender-equal, secular, non-statist, eco-friendly entity. While a battle for the border city of Kobane raged in 2014, the Turks appeared to be letting ISIS fighters and their weaponry into Syria, and preventing people on the Kurds’ side – whether they were fleeing the battle or wanting to lend a hand – from crossing the border. The US air force gradually formed an unlikely alliance with a bunch of anarchists (or quasi-anarchists, if you prefer). Together the allies liberated Kobane from IS, although Kobane was almost destroyed by bombing from both sides, and IS have on at least one occasion managed to creep back in and more battles fought. But is that alliance still on? Eventually in July 2015, after what may well have been a diplomatic crisis behind closed doors, the Turkish government allowed the USAF to use its bases. Was there a condition attached, I wonder, that as long as the US only waged war against IS but didn’t help the Kurds? I haven’t been to Syria to witness things first hand. I don’t know if the Rojava revolution is all its cracked up to be – all I know is what I’ve read and films I’ve seen, including documentaries made by the BBC, Al-Jazeera and Vice, as well as the Rojava people themselves. The only negative portrayal I’ve seen is one report in which fleeing Arab refugees were claiming the Kurds were ethnically cleansing them. This contradicted many more reports that not only did the Kurds rescue the Yazidi people from being massacred by IS, but also that Arabs (as well as Yazidis, Muslims and Christians) are as free as the Kurds in the Rojava model of democracy and people’s councils. That all have equal freedom to practice their faiths. The Rojava revolutionaries claimed that there was no evidence whatsoever for any ethnic cleansing and it was propaganda emanating from Daesh or their paramilitary allies. What I will discern is that western intervention is never a good thing. Syria has oil, don’t forget. I was one of those who cheered the Arab Spring, but just look at the end results. Egypt swapping one dictator for two successive other ultra-authoritarian forces, the Muslim Brotherhood being deposed by a western puppet; Libya carpet-bombed and Gadaffi murdered, leaving a power void filled by ISIS. Iraq… need I say more. In Saudi and Bahrain however, the Arab Spring received no help from western powers – despite the Saudi kingdom’s repression being an officially state-sanctioned version of ISIS. In oil-less countries such as Rwanda and the Balkans (Bosnia, Kosovo etc), an international UN force waded in after ethnic-based massacres to keep the peace. Could this method be a way forward? Comparisons are being made with Hitler and the Second World War… of course, while the end result of WW2 was the defeat of fascism and I’m sure that object was in the minds of many allied soldiers, the reason our government eventually declared war on Germany was to protect British interests, as well as fulfilling pacts. This is also the rhetoric being trotted out by Cameron – we are trying to prevent terrorist atrocities being carried out by IS in Britain. Surely everyone knows that what’s more likely to happen is waging war provokes more terrorist activities in Britain? Every civilian killed is surely a recruiting agent for IS? And going back a few years before the Second World War, as well as widespread support for the Nazis from Britain’s ruling class and monarchy, international volunteers (including George Orwell – see Homage to Catalonia) who set out to defend the social revolution in Spain from Franco’s fascist shock troops faced recriminations from the British government. Franco remained in power until his death in 1976 despite acts of extreme repression and genocide thanks to the Establishment of (Catholic) Church and State (Britain included) upholding his dictatorship and the Spanish monarchy, in preference to a democratically-elected republic. So while I’m all for the comprehensive wiping out of ISIS – a bunch of rapists and child killers who deal out oppression and brutality on a daily basis to vast swathes of countryside, and obliterating priceless cultural artefacts along with any dissenters, I more importantly want to see the Rojava revolution flourish and grow worldwide. I would much rather see the people of Rojava determining the wipe-out of ISIS than any outside or state power. It’ll take a massive groundswell of people worldwide to even assure Rojava isn’t trampled into the dirt by the capitalist military-industrial complex. It’s up to all of us – well any of us that believes in gender equality, environmentalism, bottom-up grassroots democracy, secular and religious freedoms – to bring it into any discussion on what to do about ISIS and Syria, and indeed the entire Middle East. Tell the people, a better world is possible, and will continue happening and growing if we do all we can to advocate and defend the Rojava revolution, even if we have some reservations… it’s the best option out there, I sincerely believe. Don’t let Rojava sink into irrelevance, or it may well become an irrelevance – or something to be dismantled while no one’s looking by the capitalist power elites. Even if the Rojava revolution is only half of the promises portrayed, it’s still hugely worth dying for. All decent people ought to promote the Rojava revolution with all fibers in their bodies. It actually looks like the people of Rojava finally has found a viable model, capable of replacing all our currently misrable economic models. The Rojava revolution might actually be what mankind has been searching for, through millenias of troubled suffering.